If you can sew a button on, you can make these perfect little bows. This is a refresh of one of my most popular tutorials from a few years ago. 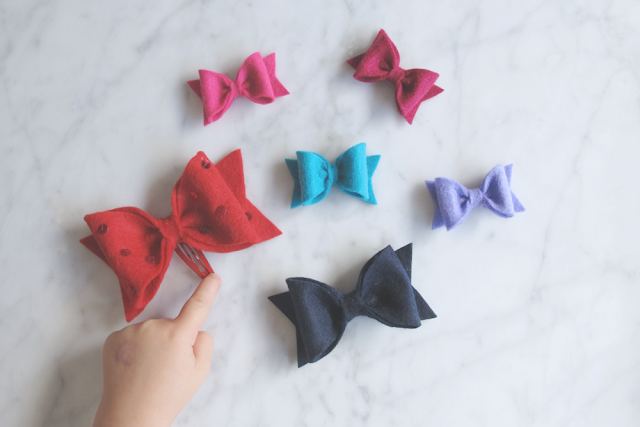 A free sewing pattern and tutorial for making these adorable little felt bows. Get them perfect every time. You can make this bow in any size. Just print or photocopy the pattern pieces larger or smaller. I highly recommend using a good sharp and strong pair of fabric scissors. The felt needs to have a clean-cut edge in order to produce a neat and smart-looking bow. I have been using the same pair of Fiskars Soft Touch scissors for 10 years and haven't looked back. When your bow is finished you can sew it onto a hair clip, headband or elastic. Be careful, making them is addictive! In an hour you might make a whole collection of them. Download the tutorial and sewing pattern.